Omar is once again proud to be exhibiting at The National Park & Holiday Homes Show. This will happen at Newbury Showground from the 19th to 21st May. Here Omar will be displaying the 2017 Accent park home. With new exterior design features and a beautiful new colour scheme, the contemporary styled 2017 Accent is not to be missed! 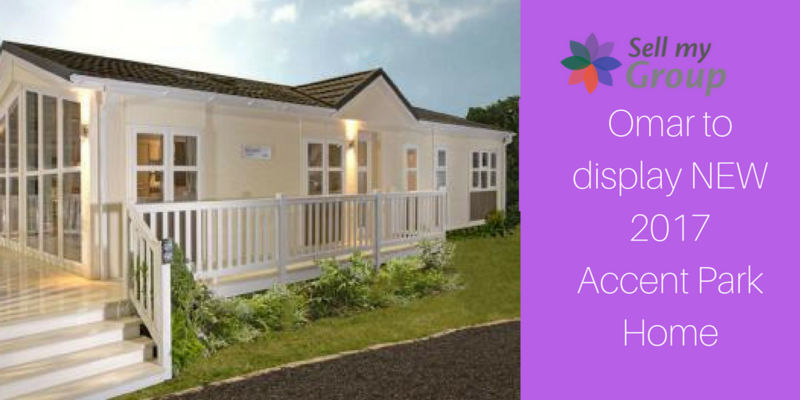 The National Park & Holiday Homes Show presents an ideal opportunity for visitors to explore the possibilities of owning their own residential park home or holiday lodge. The show also runs in conjunction with the Southern Motorhome Show. Contemporary, stylish, practical and surprisingly affordable too. The popular Accent park home has just got even better. The exterior of the new 2017 model retains many of the popular features of its predecessor. However, it now includes French doors to the fully glazed façade. Additionally, Canexel cladding now feautures around the windows, on the side elevations and to the roof dormer. The spacious open-plan living area is wonderfully light and airy thanks to the glazed façade and skylights over the lounge area. The addition of French doors allows the living space to extend outside. Here, a comfortable Cadiz-style lounge suite provides the perfect place to sit back and relax. A pendant light over the extending dining table creates a lovely ambience for entertaining. A new earthy colour palette, highlighted with a touch of spice, creates a lovely warm and inviting feel. There are also fully lined blinds and curtains and a contemporary wall-hung fire. Through into the semi open-plan kitchen and Havana pine shelves open through from the kitchen to the lounge. This design feature provides the perfect space for display and further enhances the feeling of space. The kitchen contains a full array of integrated appliances. There are also contemporary, double-opening, aircraft-style top lockers, with brushed nickel handles provide plenty of storage space without compromising on style. The earthy colour scheme flows through into the bedrooms. However, clove highlights the master bedroom and indigo highlights the second bedroom. Wall-mounted headboards, fitted wardrobes and freestanding bedside cabinets can be found in both bedrooms and the master bedroom includes a convenient en-suite shower. The Newbury model has been pre-sold to The Firs Residential Park, Bury St Edmunds, Suffolk – POA. For more information please call 01449 673 890 or visit www.thefirsparkhomes.co.uk. So don’t forget to join us on Stand 3P to be the first to see this stunning new model. For more information call us on 01842 810 673, email sales@omar.co.uk or visit www.omar.co.uk.